To say that it’s getting harder and harder every month to get hold of new Karuizawa releases is a bit of an understatement. With the single casks featured in this post, it was almost like looking for two Holy Grails (well, actually three, because there was a 1981 as well) at the same time! They were bottled for Taiwan in 2012 but only released this summer. Don’t ask why! All I know is that even die-hard collectors/speculators in Taiwan were having a tough time getting hold of these bottles at home. Until the people at Bond #1 decided to re-import a few bottles and offer them to members, we got messages from desperate Karuizawa collectors almost every day. It was all a bit surreal since I was on holiday in France when word got out… Anyway, enough drama. Time to put these old Karuizawas to the test. On the nose, the 1971 is very heavy and concentrated: sweet – think cough syrup, stewed and dried fruits – but also earthy (dried leaves) and with a very prominent fresh white peach note. After a few minutes in the glass, there’s a shift in emphasis and you get suggestions of red miso, balsamic vinegar, old parmezan, porcini, nail polish and gooseberries. If you leave it for a long time, it develops into something like orange balsamic glaze. The 1977 is much lighter and less sweet; here, the initial impressions are tobacco leaves, slightly smoked dried fruit (I have a friend here in Tokyo who’s a keen home-smoker – is there a word for that? – and the last time I met him he brought some smoked dried pineapple and mango and that’s what you get in this 1977 Karuizawa). There’s also hints of grilled mackerel (saba shioyaki), nuts (macadamias and cashews), postage stamp gum and katori senko (incense coils used to keep mosquitoes away, very common here in Japan especially around this time of the year). There’s also a lovely ruby grapefruit note that stands out if you give the whisky a bit of time. On the palate, the 1971 offers berry jam on toast, chocolate mousse with cointreau, choco-chip scones, orange sorbet, persimmons and wood spice. It’s slightly tannic but not to the point where it gets in the way of the other flavours. The finish is medium-long on After Eights and umeboshi candy. Water pretty much kills the party – it really does. The 1977 is very different, again: a combination of a tropical fruit salad (pineapple, mango, passionfruit, a touch of lime) with Japanese seven-spice powder (shichimi togarashi) and a dollop of Nutella. The finish is medium-long with slightly bitter overtones (grapefruit peel) and settles on something akin to blood orange jam. This one swims well: water throws a bit more sour in the mix, especially on the finish. Do you know if any new releases will be available in the next 1-2 months in Europe? Suspect so. I just hope that they are not following the price model of Diageo. Fair's fair regarding above comment: Diageo is following the market, not leading it, with regards to pricing. Balvenie, Dalmore and many others are already charging huge premiums for old whisky. 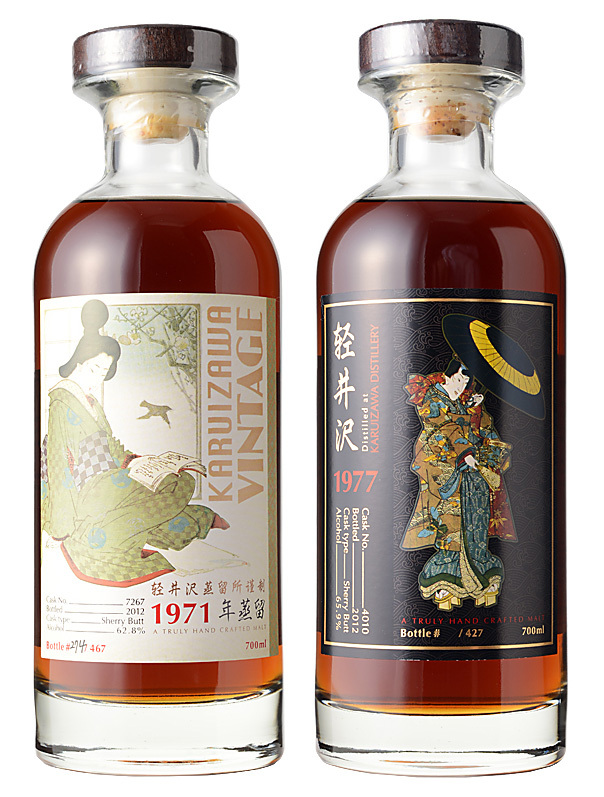 those two bottles will be part of the tasting for the Karuizawa masterclass at the Paris Whiskylive 2013, 28th september - led by Dave Broom ! I never thought i'd get the chance to taste those two, but here it is. thanks for the review, as usual, great piece ! Thanks for the kind words. Good to know that Dave will be featuring them in his masterclass in Paris. If you speak to him at the event, send him our best regards! And enjoy the whiskies... they're very special! Had the masterclass at WhiskyLive today, it was fabulous. Between the taiwanese 1971 and 1977 came the all new 73 and 74 by LMDW. All four bottles offered very interesting variations, it's really a rare occasion to taste such bottles together, making the experience even more incredible. If i had to pick one, it would have been the 1971 - i even could grab one more chance to taste as someone had not touched their dram (dont ask me how this is possible, but there were half a dozen drams left on the tables when the room had to be emptied for the next masterclass!). The 1971 had thus been breathing for almost an hour, and it was a blast - quite a fruity blast in fact. Stunning. Both the LMDW and the TWE flew by so quickly..
Any idea if there is anything left?